If you haven’t read PART 1 of this post, you might want to read that first! Here I am continuing my subject-by-subject overview of how I use Classical Conversations at home. I’m excited about sharing what we did with Science and History!! After struggling so many years with the pressure to use other curriculum (I say pressure…from myself!! ), I finally found a way that would keep Classical Conversations as my ONLY Science & History curriculum while also providing a concrete (hands on) study of the topics. 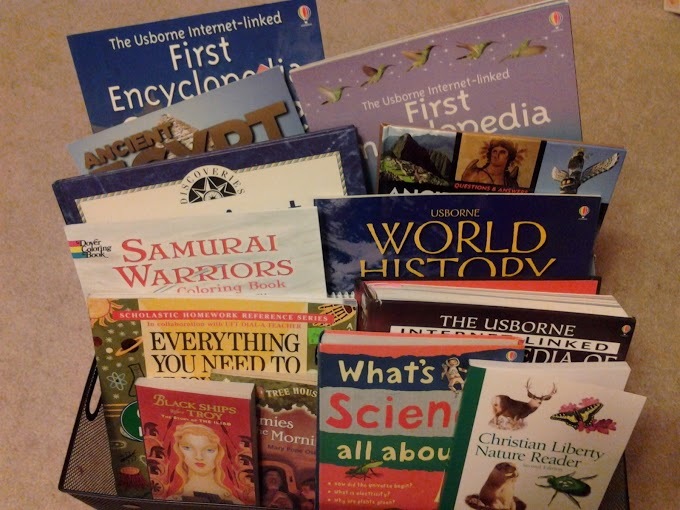 I use the idea of a Book Bin for my history & science studies. The idea is simple: Take a look at the next few weeks. See what topics or time period you will be covering for science and history. I do this by looking in my Classical Conversations Foundation Guide. Go through the books you already own and find all the books that cover those topics and put them in the book bin! I’m a book junkie so I have tons to choose from, but if you don’t have big selection then you could use the library. In a way, this “book bin” becomes my “curriculum” or my “text books.” These are the books that we read and learn from. I try to have a variety of types of books. Encyclopedias, fiction, non-fiction, biographies, novels to use as read-alouds, and more. Anything and everything! We might not read all those books, but they are there! Sometimes if we are working on math and they both need me at the same time, then I can tell one child to take 10 min. and read a book from the bin. It’s great! Each week at CC, we are introduced to a new science fact to memorize. At home we expand on that science fact. The science for CC each year is broken into 2 distinct fields of science. This year (Cycle 1) we will be studying Biology during the first semester and Earth Science during 2nd semester. During the week, we read books (from the “Book Bin”) about the science fact, discuss anything interesting, and then write or draw about what we learned. My children each have a sketch book. It has the type of paper that is blank at the top and lines at the bottom. This allows us to write something about the science we are studying and then draw, clip, copy or diagram a picture at the top. Since we do this each week (or at least most weeks), by the end of the year, we have a wonderful Book of Science. 1-3rd grade: For my 7 year old, the pages in her “Book of Science” are usually just copywork of the science fact we are memorizing that week. To change it up a bit I sometimes have her tell me something interesting that we read about. I write down what she says (narration) and then she copies it into her book (copywork). 4th – 6th grade: For my 10 year old son, I would have him take “Key Word Outline” notes (*this is a skilled learned from our IEW writing program) from one of the science books we read that week and then turn the outline into a paragraph…thus writing a science research report (1-2 paragraphs) on each week’s topic! He would also have the option to illustrate his page with a drawing, chart/graph, clipart, diagram, etc. I treat history in the same way that I treat science. At home we work on memorizing our history sentence and our timeline cards. We spend time each week reading about the topic for the week. Usually, we read from our Usborne Internet-Linked World Encyclopedia. It just happens to be the Encyclopedia that I have. However, I am thinking of purchasing the Kingfisher Encyclopedia. The Usborne Encyclopedia is GREAT, but the Kingfisher is better for the upper elementary and middle school years. My son is turning 11 this school year, so I want to get one that has a little more information to read! Classical Conversations History Cards – This year, we have a NEW set of timeline cards! Previously, CC used the Veritas Press timeline cards. The problem was that due to copyright issues, CC could not publish the timeline card titles/events in the Foundations Guide! Also, the timeline could not be added to our audio CD or any of the other fun tools and resources CC offers. This year they released their own timeline cards! I’m very excited. As much as I loved the Veritas cards, I love these even more. The events and titles are different (which means we all start over), but I believe that they represent a broader range of events, cultures, and peoples. Grades 1st-3rd: We also have a Book of History which is just like our Book of Science. It has the pages that are blank at the top and lines at the bottom. My daughter does the same thing for History as we do for science. We read through the week (together) and then discuss anything interesting. We often find connections to our geography and our timeline cards! Then she writes her history sentence (copywork) or narrated to me a couple sentences about something interesting. I write them down, and then she copies them into her book. Grades 4th-6th: My son used to do this same process, however, since he started the Essentials program at CC he doesn’t do this. As part of Essentials, he writes a paper each week. Sometimes it’s just a paragraph, while other times he will work on a 3-5 paragraph essay over the course of a few weeks. Each writing assignment is about a topic in history! The topics always “go along” with our CC cycle. His Book of History is actually just a collection of all his history reports he wrote for Essentials! I didn’t see the need to make him do both. History also includes our timeline. As I mentioned, we simply just review our timeline. Outside of review, we don’t really do much with our timeline. Learning 160+ facts on a timeline is a lot in my opinion. Geography is done during CC review time. However, I’ve recently done more with geography. After reading The Core, by Leigh Bortins, I decided to implement her ideas on teaching Geography. She has a step-by-step plan for teaching children how to draw the world, the great lines, and the continents. We have been working on those steps lately and the kids LOVE it!! During the CC year they will be learning 4-5 places/features each week. They learn where they are and can located them on their maps. We also practicing tracing and drawing their maps. Thanks!! Hope that helps give you a few ideas for you own use! This i the BEST article I’ve read on how to simply and practically use CC as your core curriculum. I absolutely LOVE the book bin idea!! I’ve always tried to keep them neatly on our bookshelves, but that’s in our basement, so I like the idea of having a BIN on our main level. They end up here anyways, so I may as well PLAN for it! Thank you for sharing with us! Thank you SO much! We are starting CC next year and this is helping me understand how it flows together!! Hi just a quick question. I use CC and am having trouble with writing daily because we use a Charlotte mason style language arts approach. I really like the idea of copy work only for language arts. Donundonspello g for 1-3? Or do you use another language arts program?? Sorry. I mean do you use spelling? During the younger years I use a phonics approach to reading. I personally used several different programs out there. All About Reading is great! But there are others as well. I didn’t worry about a formal grammar/writing program until my kids reached the Essentials program at CC which is 9 years old. Until then they simply worked on memorizing the English memory work that is included in our weekly Foundations program. This included things like definitions of parts of speech, lists of things like helping verbs, prepositions, etc., types of sentence patterns, and more. Copywork and Narration/Dictation is definitely a Charlotte Mason style and you can certainly gain much from those tools! Putting forth well written work to copy from is a wonderful and very classical approach! I say continue to do copywork in that manner and use a phonic approach to reading. Add in spelling when reading is beginning to become natural. Their spelling should be just below their reading level. Another Lang. Arts that I like for early years is First Language Lessons. It also spends time having the student memorize basics of the English language, but it’s also very gentle in its approach, which I believe is perfect for those early years! Where could I get that type of sketch book? I’m only finding blank page ones. Do you have a link or are the called something different than sketch books? Thanks!